Wow, i'm surprised about this! At least Nokia UK already announced they will have Lumia 920 out this week. Will be amazed if i somehow will have Lumia 920 on my hands by end of this week. While Finland is certainly a premium welfare country in many many things, being this small means you are not the primary market for anything. At least while the flagships were still produced here they started selling em here on the way out, but now that they all come elsewhere, we seem to be the last in line.. This Friday for the UK! Get in!!! Hopefully we won't be screwed over like we have been for the Surface launch. Usually the phones come here on the first or second wave. Phones like N9 and 808 where first in Finland. N9 was manufactured like 200m from my home too :P Not 100% sure about 808, as I worked very few shifts while that was relevant up until they closed the factory. Below some info about European dates. Woo, Finland not on the list of countries to reach during November. That said.. none of the nordic countries are listed and I believe that every other Nordic country but Finland already got their pricing and rough availability of mid-November or so. Verkkokauppa.com has said it would be available November 22. Can't find the date you provided from the site with a quick glance though..
Are any UK retailers selling Lumia 920 unlocked there outside EE? Even better if they ship outside UK. I would be a bit happier if even the official Nokia store in Finland allowed for preorders, but the fact that they have nothing at all is killing me. 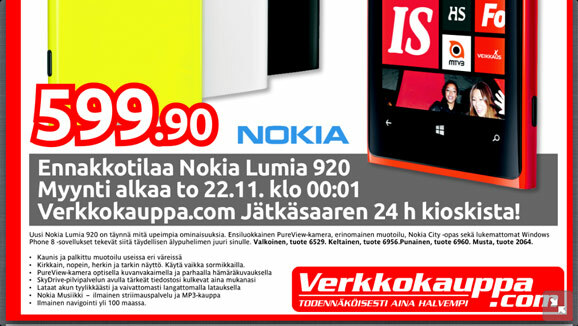 Nokia confirmed that the 599€ price and the 22.11. date that Verkkokauppa accidently leaked a bit early is true.